Discover Thunderbird Heights homes for sale in Rancho Mirage, CA. Established in the 1950s, Thunderbird Heights is an exclusive, guard-gated community nestled along a hillside and situated across from the Thunderbird Country Club. The Club features an 18-hole championship golf course and has been a favorite of among celebrities including Bob Hope and Bing Crosby as well as U.S. Presidents Gerald Ford and Barack Obama. The prestigious neighborhood of Thunderbird Heights offers an eclectic mix of Mid-Century Modern gems, remodeled classics, and Desert Contemporary style homes. The neighborhood comes with a rich history and was previously home to President Gerald Ford and Betty Ford, Frank Sinatra, and Lucille Ball. 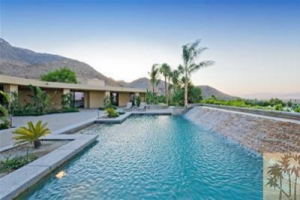 If you would like to set up a private showing or would like more information about any of the above Thunderbird Heights homes for sale Rancho Mirage, please give award-winning Rancho Mirage REALTOR® – Elaine Stewart a call. Elaine specializes in luxury real estate and would be delighted to answer any questions you may have. Call Elaine today! 760-668-2399. The beautiful hillside homes in Thunderbird Heights feature large lots and spectacular views of the valley below. The neighborhood is an eclectic mix of older classic homes and new rebuilds, mostly built between the 1950s thru the 1970s. Thunderbird Heights homes for sale in Rancho Mirage range in price from $950,000 on up to five million. The first golf course built in the Coachella Valley, Thunderbird Heights Country Club is one of the best and most historic locations in the desert! Known as the “Playground of the Presidents,” four presidents including Eisenhower, Richard Nixon, Gerald Ford, and George W. Bush have all played golf at Thunderbird over the years. Thunderbird features a par-71, 18 hole championship golf course that was remodeled in 1987. Residents of Thunderbird Heights are connected to the club by a tunnel that runs under Highway 111. In addition to great golf, Thunderbird Members enjoy a 48,000 square foot clubhouse, a 6,600 square foot state-of-the-art fitness center, and tennis courts. The fitness center offers personalized training, spa treatments, scenic hiking tours, group classes, and more. The club ’s all-inclusive tennis program accommodates beginning to advanced players. Members also enjoy a varied array of planned activities and social events such as the Guest Speaker Series, Tuesday Casual Dinners in the Grille, Art Gallery Shows, Art Class, Bridge, Wine Tastings, Wine Dinners, Tennis Tournaments & Events, and Men’s & Women’s Golf Choose Ups, just to name a few. Rancho Mirage’s River shopping, dining and entertainment complex is only a short drive from Thunderbird Heights homes for sale in Rancho Mirage. The popular waterfront patio of Acqua California Bistro is open for breakfast, lunch, dinner and Sunday brunch. Other options include the franchises of PF Chang’s, Cheesecake Factory, Babe’s BBQ, and The Yard House. With over 24 years of real estate experience, Elaine Stewart offers a wealth of local market knowledge and expertise. A licensed, professional Rancho Mirage REALTOR®, Elaine is committed to providing the personalized service and dedication that her valued clients deserve. Elaine is an expert at uncovering the right home in the right neighborhood that is the best fit for her clients’ lifestyle and requirements. She would love to speak with you to discuss what you’re looking for in your next home. Please give award-winning Rancho Mirage REALTOR® – Elaine Stewart a call today at 760-668-2399 or fill out the online contact form and she will be happy to answer any questions you may have.